AUSTIN, Texas, July 18, 2018 /PRNewswire/ -- A new global survey on work and project collaboration by Planview®, the world's leader in work and resource management solutions, highlights mounting challenges for an increasingly virtual and geographically dispersed workforce. According to the survey results from 650 knowledge workers, teams lose as many as 20 hours per month due to tools that are not integrated or centralized across the organization. 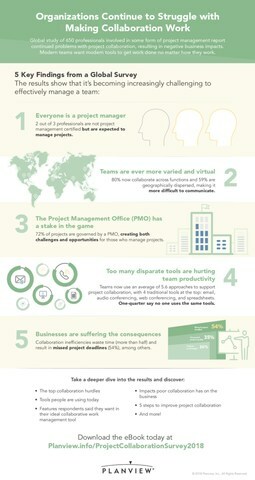 The project management office (PMO) has a sake in the game, governing 72 percent of projects across the organization. This top-down focus on standard project management processes means more projects map back to strategic objectives and an organization's bottom line, adding complexity and accountability to projects. Project managers, stuck in the middle, must now balance the many ways their teams work against providing a standard record of progress, status updates and cost to the PMO.